Buying a Theatre Breaks Voucher for Christmas presents sounds a great idea: doesn’t it? And you are not the only person thinking that. I’ve just enjoyed a great conversation with one of our regular customers and it seems to cover the ground required to make sure you get the right break at Christmas. There is nothing on in Stratford-Upon-Avon like Dirty Dancing but there are some great shows in London similar to Dirty Dancing. I’ve just seen Memphis which is superb – it stars Beverley Knight. The music is soul-inspired music and it is about a white DJ who tries to get soul music heard on the radio in 1950’s Memphis. The reviews will be out next week but expect good things and 5 stars etc. Other great shows include Matilda, Miss Saigon and Wicked (right). They are all on throughout the week in London. If you want to go to Stratford-Upon-Avon the RSC plays at that time will be The Merchant of Venice and Othello. Both great but nothing like Dirty Dancing! If you decide on a rough date, length of stay and type of hotel you would like to stay in, get back to me and I can check prices. That’s great thanks..as we are men and wont have a clue what they would like to see next do you do a gift card that covers a performance, one night hotel stay & meal..? Unfortunately we do not offer a specific voucher but you can buy a cash voucher to a value that would cover it. 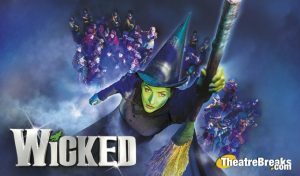 A one night stay at a 4 star hotel in Kensington on a bed and breakfast basis, with best seats for Wicked or Jersey Boys, Beautiful or Memphis for a Saturday night, for example on 06 June 2015, would cost about £350 per couple. Alternatively create your own voucher and put it in a Christmas card… I can send you a list of shows and a couple of likely weblinks so that within a few minutes on Boxing Day you can have a break organised to see the show you know they want to see without having the outlay now! A pre-theatre dinner would be extra but you could either add that to the package or organise it on the night. Depending on the show they finally chose we can tie that up with a nearby restaurant: most Theatreland restaurants offer pre-theatre menus at good rates.